There's an "alarming lack of information" about California's biggest reservoir, finds a major new analysis of the state's groundwater resources. As water levels dwindle in California’s rivers and reservoirs, many farmers and water districts are relying on the state’s vast underground reservoirs instead. In drought years, groundwater provides up to 60 percent of California’s water supply, according to rough estimates by state officials. But exactly how much water is being tapped from beneath our feet is largely unknown. Public information about groundwater is sketchy, even in regions where over-pumping is a chronic problem, according to the report from Stanford University's Water in the West program, a project of the Woods Institute for the Environment and Bill Lane Center for the American West. The authors warn that after decades of unrestrained pumping, California is a long way from reaching a sustainable balance of withdrawal and "recharge," the term used by hydrologists for water that gradually refills most groundwater basins. Groundwater is often called California’s “savings account,” holding significantly more water than the state’s surface reservoirs. In dry years, groundwater pumping increases to make up for lost supplies. This year, some California farms could replace as much as three-quarters of their surface water shortfalls that way, according to a study by U.C. Davis. Hypothetically, in wet years, the groundwater is replenished as rain and snow percolate back into the ground. But in many parts of California, groundwater is pumped faster than it’s being replenished. NASA satellite data show that over the last 50 years, the Central Valley’s groundwater has been on a steady downward trend and has hit all-time lows in some areas. Water tables have dropped by 100 feet in parts of the San Joaquin Valley. 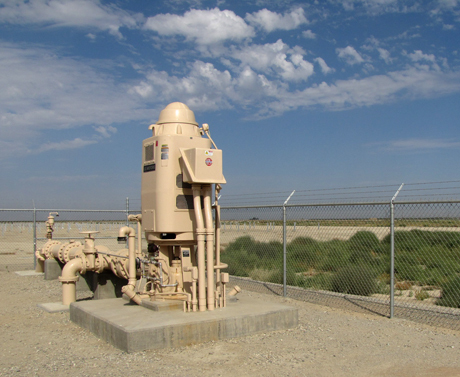 Groundwater pumping is largely unregulated in California, except in places where judges have ruled in specific disputes. Landowners are generally free to pump as much as they want from under their property. The extent of the problem is being masked by a lack of information, according to Stanford researchers. Crucial data, like how much groundwater is being pumped and how fast levels are dropping, are only collected and shared in a few parts of the state. Maynard looked at groundwater basins across the state and ranked them according to their public accessibility. That includes groundwater elevation, which drops as groundwater is extracted, and production metering, such as tracking how much water is being pumped at each well. He also considered well drilling logs, the records that are collected by drillers about the depth and location of a water well, and whether a region had a groundwater model, a comprehensive tool that helps water managers make predictions. A handful of regions, like Orange County and Santa Clara Valley, have taken a proactive approach to sharing groundwater information, but many places are lagging behind despite serious concerns about over pumping, according to the Stanford analysis. Maynard says when it comes to groundwater levels and metering of use, there’s nothing that prevents regional water districts from collecting and sharing the information. Well drilling logs, on the other hand, are kept secret by law. The information is reported to California’s Department of Water Resources, but the records are considered confidential. California lags behind almost all other Western states when it comes to groundwater monitoring and reporting, according to data from the Nature Conservancy. Well drilling logs are publicly available in every Western state besides California. California water officials are attempting to gather more comprehensive information about groundwater use under a program known as CASGEM (California Statewide Groundwater Elevation Monitoring). It was authorized by a bill passed by the state legislature in 2009. Under the program, regions must designate a reporting entity and then share information about groundwater levels. Participation is voluntary, though regions that don’t share data lose eligibility for some state water grants. Getting participation has been a slow process, according to state officials. Of 515 groundwater basins, only 208 are fully or partially reporting data under the program. As a result, the state has focused on participation in areas that are highly reliant on groundwater. 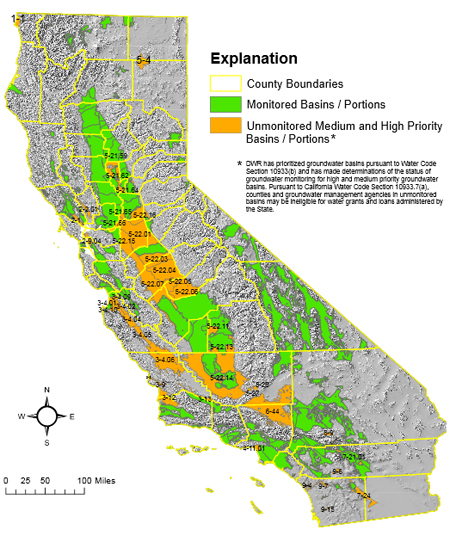 That includes about a quarter of California’s groundwater basins, which have been designated as high-or-medium priority. The state is now getting at least some groundwater data from 78 percent of those areas. But Scruggs says there’s still a lot to be done before the state gets a grip on groundwater use. Currently, the groundwater data is only reported to the state twice a year. Some agencies have shown little interest in participating. “It could be they don’t have the financial wherewithal to be doing it,” Scruggs says. Other areas would prefer to keep the information secret. “They don’t have wells or the wells' owners aren’t willing to make that information available,” she says. State lawmakers are considering ramping up groundwater regulation, prodded by this year’s extreme drought. Two bills, SB 1168 and AB 1739, would require regions to put together groundwater management plans, following recommendations from the California Water Foundation and the Association of California Water Agencies. Scruggs says data and reporting will be a critical part of any regulation. “If you don’t know what’s going on with the groundwater, how do you manage the resource?” she says.